Wood sorrel is a woodland wildflower of early spring – this was taken in the Quantock Hills in a pine plantation. A trip to see the fly orchids in Bedford Purleius NNR has become something of an annual tradition now – they never fail to delight! Black nightshade is a member of the same family as potato and tomato and could be found flowering right up until Christmas! Bees and butterflies have had a blog post to themselves, but here are a few other invertebrate encounters from 2017 I thought I’d share on the penultimate day of the year! These were taken in Great Wood in the Quantock Hills. We spent a while being amazed at the ability of these tiny creatures to pull twigs and other materials into position around their nests, joining others to give assistance where required or simply tugging with amazing tenacity until they got where they were going. Soon we also noticed the guard ants, who were trying their hardest to intimidate us into backing away and leaving the nest in peace! 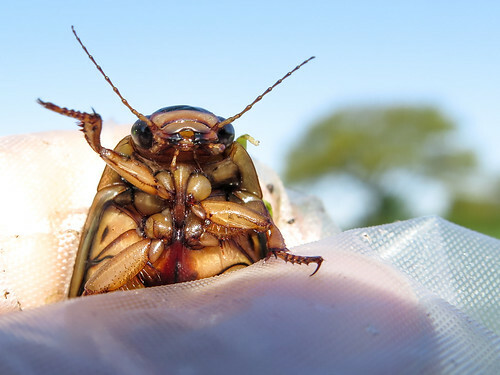 We came across this beast when doing great crested newt surveys in the springtime – the bottle traps used to catch and count the courting newts also work for other species such as this, one of our largest beetles. They can have quite a nip, so I’m told, so this one was handled with care before being returned to its pond in a pasture field. 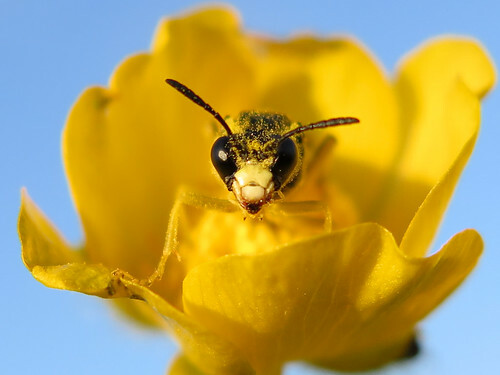 I came across this little sawfly – its head dusted with pollen – settled in a buttercup flower in Muston Meadows in early summer. It didn’t move as I got into position to take a photo, and I could only assume it had settled there for the night. This amazing looking creature was feeding on the fool’s water cress flowering at the edge of our garden pond. 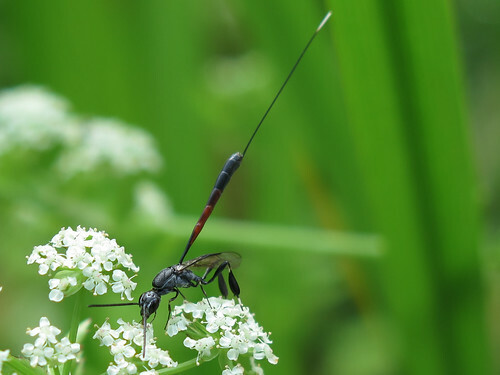 The amazing ovipositor is so much larger than the wasp itself which made it look for all the world like a radio-controlled insect as it flew between flowers! I came across this little wasp feeding on the hogweed flowers on a walk through Cheddar Gorge and thought it deserved a portrait – the rounded head with the eyes wrapped around looks as though it could have been the inspiration for a number of sci-fi aliens! 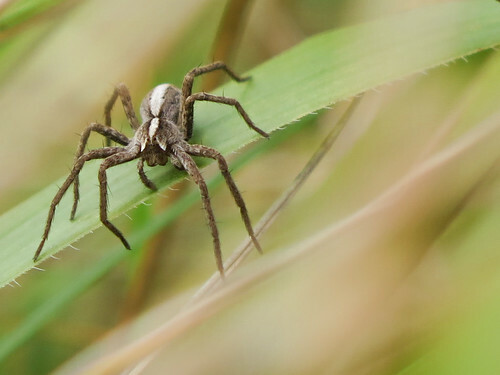 I was walking through the Hills and Hollows above Grantham one afternoon and came across a series of holes in the bare earth – I watched a while and saw several heads peeking out before one of the insects arrived from outside and I could get a proper view. 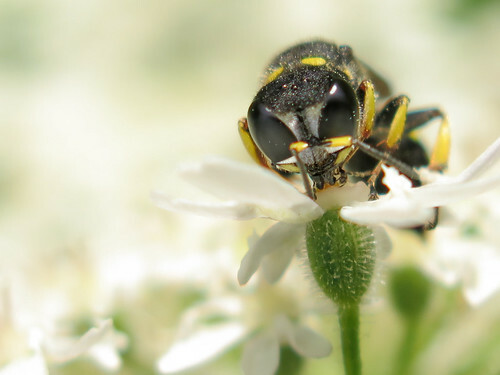 This is a species of digger wasp whose prey is bees such as this solitary bee held beneath its body. The wasps bring the bees back and pull them underground to provide food for their larvae. Darter dragonfly – Sympetrum sp. This dew-bejewelled dragonfly was resting on a flower stem in Muston Meadows in August. 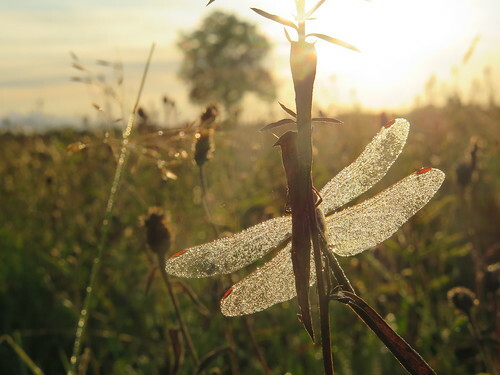 Taken just after sunrise, this shows the roosting behaviour where the dragonflies will find a safe place to spend the night, waiting for the sun to warm them in the morning and get them up to temperature so that they can take to the wing once more. 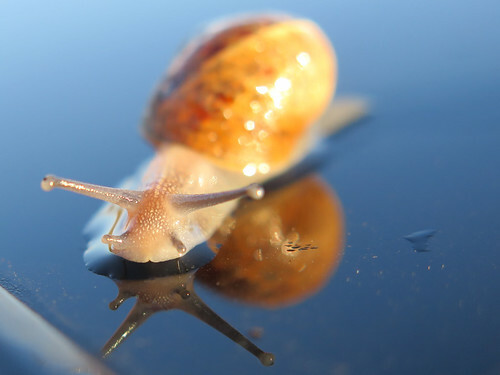 This little snail was crawling across the roof of my car when I got back from a dawn bat survey in late summer. I’m not sure how it made its way all the way there, but I liked the reflection in the early morning sunshine. I popped it back into the vegetation in the verge before heading home! This photograph was taken in the Grantham Hills and Hollows in late summer as the grasses were beginning to turn from greens to browns. I had bent down low to get a photograph of one of the wildflowers, and then my eye was caught by how many invertebrates were active just in the grasses beside it. This grasshopper was taken on the same afternoon as the wolf spider above – I’m afraid I haven’t attempted an ID on this little character but would welcome any suggestions! 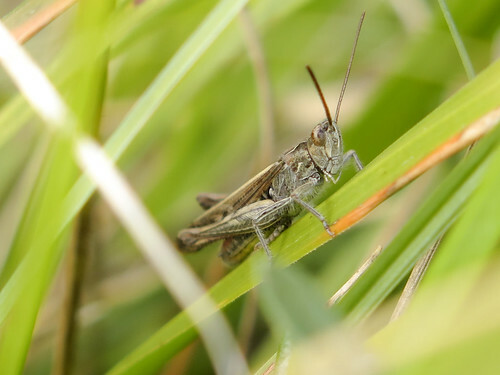 The camouflage of this grasshopper amongst the greens and browns of the aging summer grassland meant I only spotted it when it hopped to another location. This amazing beetle was trundling across a forest path in the Quantocks in autumn. 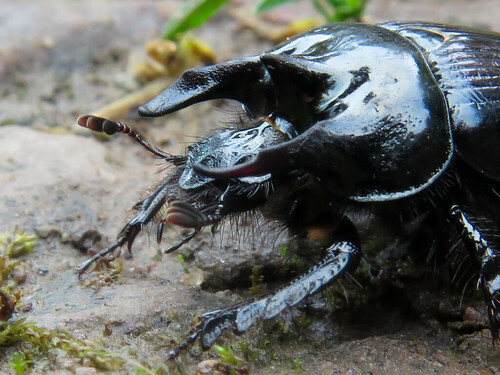 Despite the fearsome looking horns, they are not predatory but are in fact a species of dung beetle which feeds on rabbit droppings amongst others. 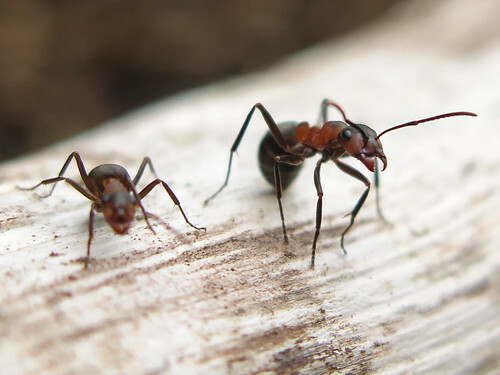 They nest in deep tunnels and will pull the dung back down with their powerful legs in order to provision the larvae.